I have been working as a consultant at Kansas Overseas Careers from past many years. I have seen that due to the large number of opportunities in Canada many people aspire to move to Canada. The authorities have come up with one of the best immigration programmes for skilled workers. This is the Express entry system. I get several queries about the Express entry system. Here are some of the most common questions that candidates ask me. Can you explain the Express Entry Program? 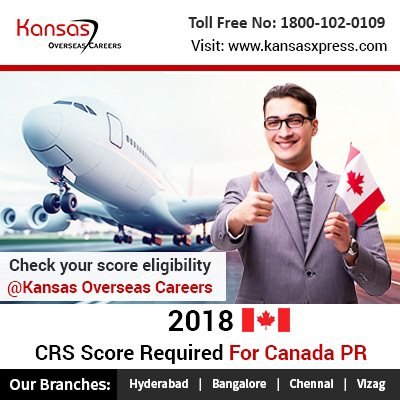 In this programme the candidates are selected for the Canada Permanent Residence / Canada PR on the basis of the scores that they get in the Comprehensive Ranking System (CRS). Candidates who have better scores will have better chances of getting the invitation to apply for the PR visa for Canada. Can you give us an idea about the Canada Express Entry latest draw? Every fortnight the Immigration Refugees and Citizenship Canada will select those candidates who have high CRS scores. For every draw there is a minimum cut off score that is needed. This cut off score is decided by the IRCC. Candidates are very anxious about this cut-off score as this will decide their fate in the express entry programme and it will decide about their chances to get the invitation to apply for the visa. What can be a good score for 2018? One must have a score of around 445. But as per last year’s trend if you manage to get a score of 456 or more then your chances of getting selected are even better. What are the chances that the cut off score may reduce this year? Canada wants to increase the number of skilled immigrants coming into the country. For this purpose they have increased their target this year. So there is a possibility that the cut off score may get reduced. But it is better to try and score as many points as possible in order to increase the chances of getting selected for the draw. Candidates with less points must try and increase their scores. It must be noted that the scores are based on a number of factors like age, language proficiency, work experience, qualifications, skills etc. Now the candidate has no control on factors like age. But he can improve his scores by upgrading his skills or by scoring well in the English and/or French language tests etc. Better the scores better will be his chances of getting selected. What are the other options that low scoring candidates have? Keep in mind that there is no need to lose hope if you do not get a good score. Canada has introduced a number of other programmes in order to provide an opportunity to more number of immigrants to migrate to Canada. One such programme is the Atlantic immigration pilot program. This is a partnership programme between the Canadian government and four provinces of Canada. The Atlantic region employers can hire candidates who are not citizens or PR of Canada for working in their organization. If the candidate fulfills all the requirements then he can apply for Canada PR. Can Canada Immigration consultants be helpful to candidates? Yes, they can help you in a big way. But for this you need to make sure that you opt for only good and reputed immigration consultants. Take the example of Kansas Overseas Careers. They have successfully helped many aspirants migrate to Canada.